I love to troll back issues of Bon Appetit for great ideas. This one is modified from the June issue of 1991 and is a great alternative to tossed salads. I hope your family loves it as much as mine! FOR SALAD: Bring large pot of salted water to boil. Add green beans and cook until tender-crisp, about 4 minutes. Using slotted spoon, transfer to bowl of ice water to cool. 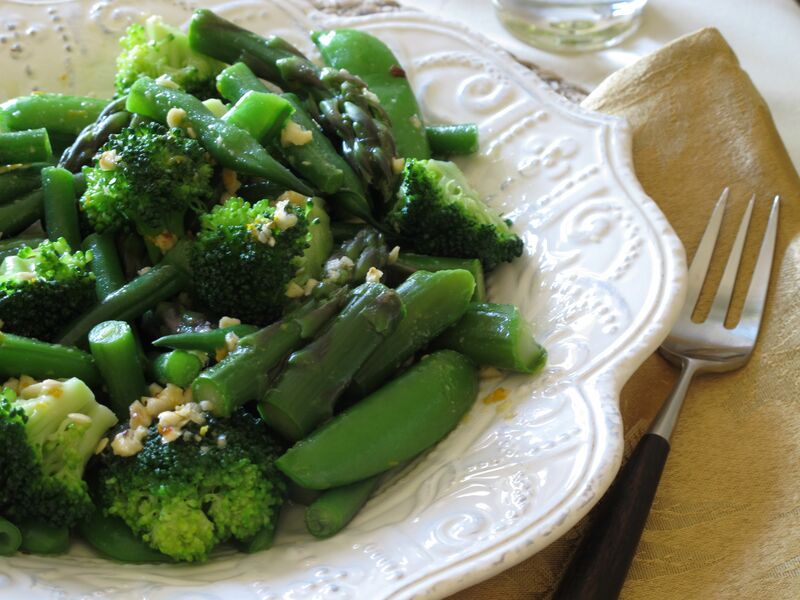 Bring water back to a boil and add broccoli and asparagus and cook until tender-crisp, about 3 minutes. Drain well and add to the bowl of ice water to cool. Drain and dry cooled vegetables, toss gently with dressing and serve immediately. Note: vegetables may be prepared one day ahead and stored in refrigerator; toss gently with dressing when ready to serve. FOR DRESSING: Whisk first 5 ingredients in small bowl. Mix in hazelnuts.